One of the most dangerous electrical hazards in the workplace is arc flash. Also referred to as a flashover, an arc flash is a type of electrical explosion that has the potential to cause serious damage to workers and property. 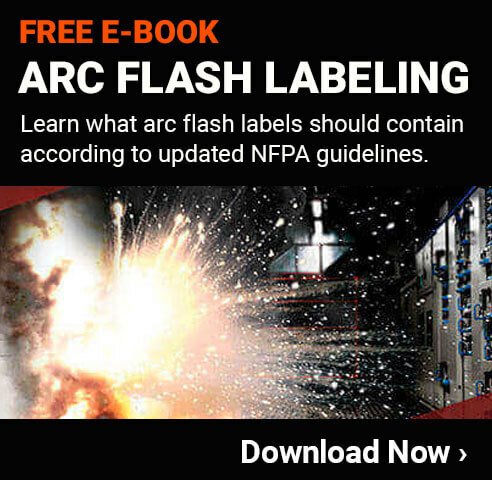 Arc flashes occur when an uncontrolled electric current flows between conductors through an air gap, causing a release of a huge amount of energy. A lower path of resistance in the electrical system allows electricity to pass outside of the system and the light and heat traveling through the air between the two points is an arc flash. Any workplace that works with electricity or electrical equipment are at risk for arc flash, no matter how weak electrical currents are or the level of electricity flowing through the system. In high-voltage systems however, the occurrence of an arc flash will be much more destructive. Larger arc flash explosions typically result in a release of intense heat, reaching temperatures hotter than the surface of the sun. The heat alone can immediately ignite wood and melt metal, damaging equipment in the facility. Although arc flashes last a handful of seconds at most, anyone in the immediate area of the explosion is in danger of getting second- and third-degree burns. In addition to the damaging heat produced from an arc flash, these explosions are usually extremely bright, and the UV and infrared light can result in temporary eye injuries or even permanent blindness in some cases. Arc flashes may also cause deafening noises and people not wearing hearing protection can experience long-lasting hearing damage. Finally, electrocution is always a hazard when an arc flash occurs. Arc flashes have the potential to travel through a person and depending on the amount of electricity, it can be fatal. Organizations with electrical equipment and systems must take arc flash safety into serious consideration. It is important hazards must be evaluated and arc flash warning labels should be utilized wherever high electrical currents exist. Having an effective lockout/tagout program to ensure machines are de-energized helps to prevent arc flash but because arc flashes are so unpredictable, workers must also be provided with the correct arc-rated PPE.